Thanksgiving Challege, Week 1 - Ditch the Disposable Swiffer! Let's talk about disposable cleaning products for a sec, shall we? I think many of my weekly tips will probably be on this topic. Disposable cleaning products may be convenient and reduce the ick factor (I get it, I have two big and rowdy dogs), but they don't breakdown in the landfills, nor can they be composted. Plus, every single box you buy is unnecessary packaging, shipping on trucks, etc. 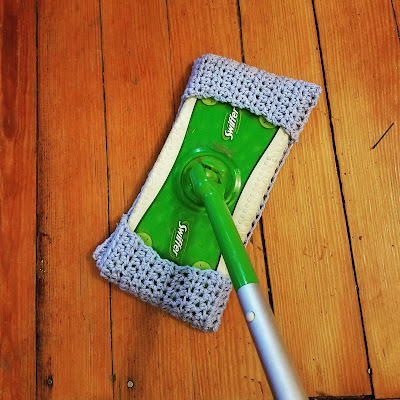 I'm not saying you have to throw away your Swiffer mop if you already have one, but consider some more environmentally friendly alternatives to those cloths. Contrary to marketing, they are not magic. A microfiber cloth or a crocheted reusable cover will do the job just as well.